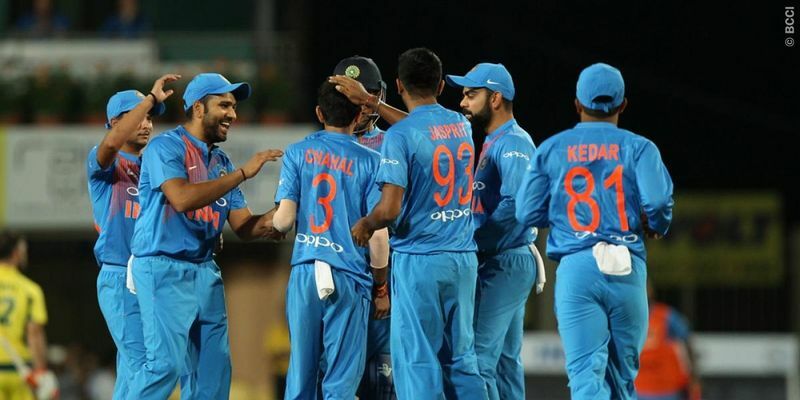 Brief scores: Australia 118/4 (18.4 overs) (Aaron Finch 42, Glenn Maxwell 17; Kuldeep Yadav 2/16, Jasprit Bumrah 2/17) lost to India 49/1 (Virat Kohli 22*, Shikhar Dhawan 15*; Natan Coulter-Nile 1/20) by 9 wickets (DLS). India opted to field after winning the toss as the volatile weather and bounce less pitch didn’t allow Virat Kohli to take too many risks. Shikhar Dhawan returned to the line-up replacing Ajinkya Rahane in the opening slot while Yuzvendra Chahal pushed Axar Patel to the bench. Australia saw a host of changes too, which saw the likes of Moises Henriques, Jason Behrendorff and Daniel Christian coming into the side. The game somewhat fizzled out in the initial stages after a very promising opening over that saw David Warner hitting Bhuvneshwar Kumar for two consecutive boundaries before getting bowled out to a ball inching in. With the pitch offering very little pace and bounce, Hardik Pandya was definitely not the bowler for India as Aaron Finch started taking him on. With the big-hitting Finch and Glenn Maxwell at the crease, Kohli decided to let his pacers bowl out the powerplay overs that resulted in Australia scoring at 8 runs per over. As soon as the field restrictions ended, Kohli opted to bring in Yuzvendra Chahal and the wrist spinner had an instant impact as he dismissed Glenn Maxwell, who gave away his wicket to Bumrah at mid-wicket. Kuldeep Yadav attacked from the other end and choked out the runs the Aussies were scoring so freely in the powerplay. With the run rate not at a desirable position, Finch had to take up the cudgel and his uber-adventurous stance was just what Kuldeep Yadav needed to do the trick. The explosive batsman was sent packing in the 10th over with Australia reduced to 77-3 at the midway point of their innings. India stuck to their full-proof approach of attacking with variety as Kohli had used all his five bowlers in the first 10 overs. And barring Pandya, whose attempts to hit the deck hard ended up being short-pitched deliveries, everyone else excelled. Yadav struck again in the 13th over as his ball kept low, thanks to the Ranchi pitch, and Moises Henriques’ bails were dislodged. Australia were under a lot of pressure and at 87-3, Pandya joined the party as he scalped Travis Head’s wicket in the very next over. Tim Paine had as many as three close shaves before he decided to ride is luck by going big against Kumar, hitting the pacer for 11 runs in the 17th over. However, Bumrah exacted revenge for his bowling partner as he uprooted the Paine’s stumps. In his next over, Coulter-Nile was sent packing as well as Australia were reduced to a mere 113/7. After Dan Christian was dismissed by a brilliant direct throw by the Indian skipper, the rain gods decided to make an appearance with the score at 118/8. With eight balls left in the Australia innings, the rains ensured that the visitors would not finish their quota for 20 overs. The rain interruption had reduced Australia’s score of 118 to just 48 runs from six overs. Australia saw a glimmer of hope when Nathan Coulter-Nile scalped off the Rohit Sharma's wicket in the second over. However, skipper Virat Kohli and Shikhar Dhawan kept putting the ball over the ropes in every over to bring the equation to a run a ball by the final over. Kohli's lob over mid-off was enough to secure a nine-wicket victory for the hosts. India have now taken their T20 winning streak against Australia to seven games and lead the 3-match series 1-0. Chahal or Axar? Who will take more wickets for India?